This I look at the editing structure of the Fred Astaire-Ginger Rogers musical Follow the Fleet (1936). I looked at the structure of Top Hat in an earlier post, which you can find here. 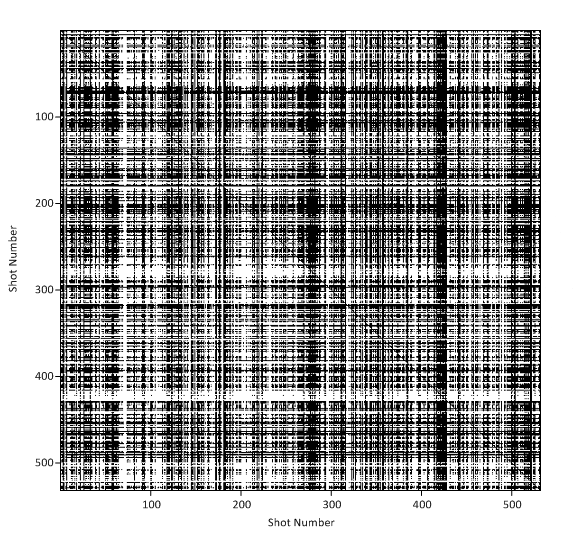 Figure 1 presents the order structure matrix of Follow the Fleet, in which white columns indicate shorter shots and darker patches represent clusters of longer takes. A spreadsheet with the raw data (from a PAL DVD and corrected by 1.4016) can be accessed here: Nick Redfern – Follow the Fleet. The opening and closing credits have not been included. The editing of this film doesn’t show the same clear pattern of alternating between quicker and slower cut segments we see in Top Hat. 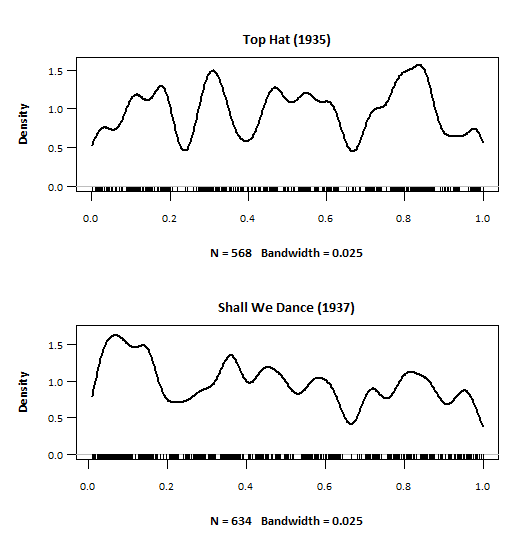 Follow the Fleet is certainly cut much more slowly, with a median shot length of 7.5 seconds and an interquartile range of 10.4 seconds compared to Top Hat’s median of 5.5s and IQR of 7.2s. In the earlier film the different editing patterns were associated with musical numbers and comedy sequences, but Follow the Fleet lacks the comedy element. Randolph Scott is, I’m afraid to say, terribly dull in this film (and calling his character ‘Bilge’ doesn’t help). The spark between Astaire and Rogers that drives Top Hat, especially in the first section set in London, is missing here to and at nearly two hours long this film doesn’t hold the same interest. It somehow achieves the stunning feat of being both lacking in plot and predictable. There does not appear to be any particular trend over time in the editing structure, and this may be due to the high variability of shot lengths. The IQR noted above is much greater than appears to be typical for Hollywood films of the 1930s (or indeed any period), and so the time series in the order structure matrix looks relatively featureless. Those features that do stand out in the matrix are those sequences comprising several longer takes and these are typically associated with the musical numbers. 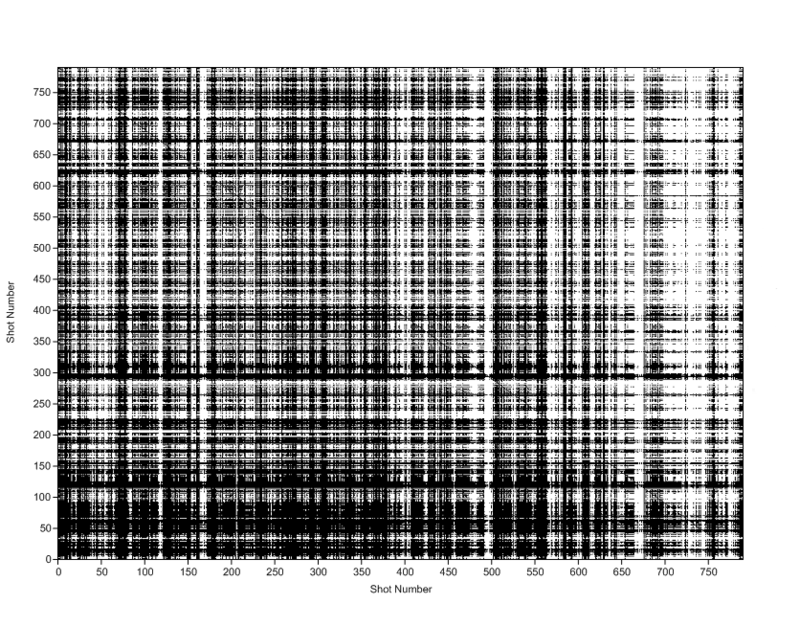 However, not all musical numbers are associated with such clusters. For example, ‘We saw the sea’ (shots 1-8) and Harriet Hillard singing ‘Get thee behind me Satan’ (shots 124-128) do not immediately jump out at you; while the dark column between shots 270 and 286 is ‘I’d rather lead a band,’ running to 351.1 seconds with its extended dance sequence on-board ship, is instantly recognisable. ‘Let yourself go’ appears several times throughout the film, making its bow with Rogers singing between shots 59 and 67, with the comic dance competition to this tune running from shots 132-150. These numbers are not associated with the sort of clusters of longer shots we see in the second half of the matrix, though they are generally slower than other sequences in the first 35 minutes of the film. Rogers’ solo tap dance audition is shot 317, and is followed by a cluster of short shots (319-325) when Astaire overhears how successful she is and decides to sabotage her singing audition. The subsequent disastrous reprise of ‘Let yourself go’ after Rogers’ drink has been spiked occurs at shots 333 to 338. Hillard singing ‘But where are you?’ begins and ends at shots 356 and 359, respectively, but this does not show up in the matrix as distinguishable from the shots around it. The musical sequence featuring ‘I’m putting all my eggs in one basket’ begins at shot 416, with Astaire playing piano, and the number itself starts at shot 421 and runs until shot 428 for a total of 334.2 seconds. The most famous sequence from this film accounts for the cluster of long shots from 506 to 534, and includes ‘Let’s face the music and dance.’ The number itself only accounts for the last 2 shots running to 286.0 seconds. Both Top Hat and Follow the Fleet were directed by Mark Sandrich, and David Abel was the cinematographer for both films. Top Hat was edited by William Hamilton, whereas Follow the Fleet was edited by Henry Berman. We do not know enough about RKO’s mode of production to determine how the working relationship between these and other filmmakers was structured, and so we will have to wait and see what the editing structure of other musicals in the Fred Astaire and Ginger Rogers series for the studio will tell us about the authorship of these films (if, indeed, there is any such person). Back in the summer I wrote a post looking at the relationship between the discourse structure and the formal structure of BBC news bulletins (see here). This week I have the first draft of a similar paper looking at news bulletins from ITV. We analyze shot length data from the three main daily news bulletins broadcast on ITV 1 from 8 August 2011 to 12 August 2011, inclusive. 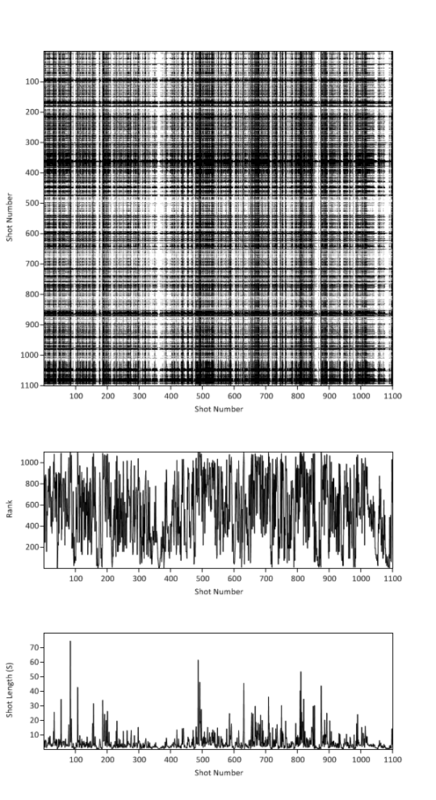 In particular, we are interested to compare the distribution of shot lengths of bulletins broadcast on different days and at different times across this time period, and to examine the time series structure by identifying clusters of shots of shorter and longer duration in order to understand the relationship between this aspect of the formal structure to the discourse structure of these broadcasts. The discourse structure of the bulletins in this sample is fixed, and remains constant irrespective of the subject of news items themselves suggesting that content is adapted to meet the needs of this structure. 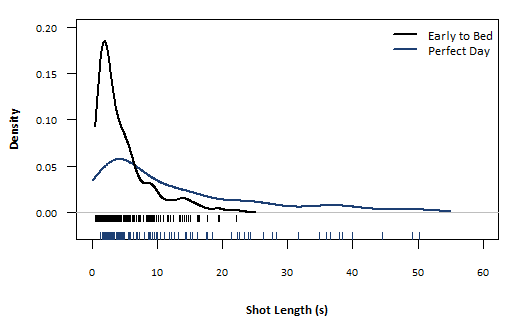 The statistical results show that neither the day nor the time of broadcast has any impact on the distribution of shot lengths, and the editing style is consistent across the whole sample. There is no common pattern to the time series of these bulletins, but there are some consistent features in the time series for these bulletins: clusters of longer takes are associated with static shots of people talking on-screen, while clusters of shorter takes occur with montage sequences, sports reports, series of news items, and footage from non-ITN sources. Consequently, the presence and order of discourse elements in a bulletin shapes its formal structure. In both samples clusters of longer shots are associated with people speaking at length on camera, and these shots are framed in the same way. In both samples clusters of shorter shots are often associated with montage sequences accompanied by a description from an off-screen reporter or with footage that is derived from other sources (e.g. library footage, other broadcasters). In both samples, there is no evidence of any trends or cycles in the time series. 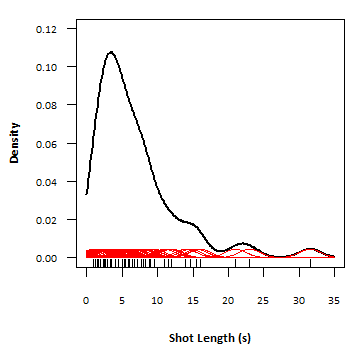 There is no significant difference in the median shot lengths and dispersion of shot lengths in the two samples of bulletins (BUT remember these are from different times of the year, so this information is only of limited use). Day and time of broadcast have no impact on news bulletins for either broadcaster (but again the comparison is not as direct as I would like). Overall, there is some evidence that news bulletins are stylistically homogenous across these broadcasters. I will do another study looking at the comparing the bulletins from the both the BBC and ITV from a single week, but this will have to wait for another day.